A note: My first book comes out later this month! Here’s an excerpt from one of the chapters. To get early access to the whole book, look for the link to The Book Factory at the end of this post. If you could see me as I type this, you’d see that I’m gleefully rubbing my hands in anticipation. Because I’m going to talk about how to build out the content on your website, and I’m about to share the system you can use to make this work efficient, effective, and — dare I say it? — fun. Content marketing works when you create useful, interesting, and engaging information consistently over time. It’s all about showing up reliably and being helpful every single time. Sounds daunting, doesn’t it? Are you wondering what in the world you’ve signed up for? Well, don’t worry. From here on out, everything I’ve written will teach you an efficient approach to your ongoing content creation process. Because if you’re going to use content to market your business, you’re going to need to be in it for the long haul. We’re going to make your journey as pleasant and productive as possible. It’s just us here, so let’s be perfectly honest. Efficient content creation is appealing to you, isn’t it? So let’s explore how you can become the most efficient content creator out there. It all starts with setting up an environment where content creation can flourish. Now that you’re an adult, you don’t have to plan any of these things or figure out how to do them. You probably do them the same way every time. They’re a natural part of your day or your week. Why do you do them so effortlessly? Because whether you recognize it or not, you’ve already got systems in place for getting them done. When it’s time to brush your teeth, your toothbrush and toothpaste are in the same spot they’ve always been. All you have to do is grab them and begin. There’s no resistance to the task because it’s frictionless: simple, easy, and efficient. It may be difficult to believe, but content creation can be just as frictionless as all of the tasks above. This article will help you identify how to set up a physical and mental environment that will make the process easy and natural for you. Content creation is both a physical and mental task, so it’s important to plan for both aspects. Once your physical environment is prepped and ready, you’ll be able to create content the same way you brush your teeth: you’ll have what you need right at hand so you can grab it and get started. And once we’ve worked on your mindset, you’ll find your mental environment will be prepped and ready for you to dive into your content creation process, too. It’s funny to me that I’ve never heard anyone address the physical aspect of content creation. Let’s face it: we can’t just think our content into existence, can we? We have to sit or stand and place our fingers on a keyboard or pen to paper and begin physically writing the words that will make up our content. This happens in a space and in a moment in time. Let’s talk about both. Is a place where you’re physically comfortable. Your chair supports you, and you can easily reach your keyboard or your notepad without scrunching up your shoulders or craning your neck. If you stand, you have a supportive surface below your feet and good shoes, so your legs and back don’t suffer. Is a spot with the best light for you. You recreate the lighting that works for you. Some people focus best in a dark “cave,” with shades drawn and a single light illuminating their work surface. Others feel more productive with bright natural light. Identify what lighting setup helps you do your best work. When it’s time to create your content, make lighting part of the setup. Is convenient and nearby. You’ll resist your content creation tasks less if you don’t have to travel to get to the place where you’ll create content. Find a spot that’s already close by, and designate it as your content creation station. Has everything you need within arm’s reach. My content creation station is a red reclining chair in the corner of my office with a small blanket I can throw over me if I get chilly. On the small table next to this chair, I have a place to set my coffee cup, a pencil and pad for notes, a tissue box, and some lip balm. I write on a computer and have a thesaurus and dictionary just a few clicks away. Your setup will look different than mine. Content creation is a job like any other job; put your tools together, so they’re within easy reach. Features sound — or the sound of silence. Some people prefer a little background noise (or music), and others need complete silence. What works best for you? Pay attention, and make what you hear part of your setup. Is distraction-free. When it’s time to create content, you’ll get more done if you shut down distracting websites and social media sites, and silence your phone. Content creation also happens at a moment in time. For most of us, our mental energy runs in a predictable daily cycle. We’re most efficient around the same times every day. Sometimes we have no choice — it’s a matter of working around our other responsibilities. If you have young children, for example, your efficiency may increase dramatically the moment they lie down to go to sleep at night! If you haven’t identified your peak creative times of day yet, I’d like you to pay attention to this over the next few weeks. At what time of day does creative work seem to come easily to you? And when does your brain consistently feel like mush — like you couldn’t get an original thought out of it even if you squeezed it? There’s no right or wrong answer here. I want you to find your time, not anyone else’s. Once you pinpoint your peak creative time, plan to use at least part of it for content creation. When you do this, you’ll find putting together your content will be easier, faster, and more efficient. Does everything have to be “perfect” to create your content? Do you have to be in that ideal physical environment and in the middle of your peak creative time in order to create content? I’ve done enough writing at hotel desks and in plane seats to attest to the fact that great content can come out of a variety of environments and times of day. What we’re talking about here is how to set up a frictionless environment and timeframe for most of your daily or weekly content creation work. You’ll find that once you’ve set yourself up in a supportive environment and found a time slot that works for you, content creation will become more of a habit than a to-do item. Habits done in one place can easily be transferred elsewhere. If you’re staying in a hotel, you can still brush your teeth, right? And it’s still automatic because you’ve trained your body to grab what you need and get the job done. Do the same for your content creation process, and you’ll find it’s easier to make it happen no matter where you are. 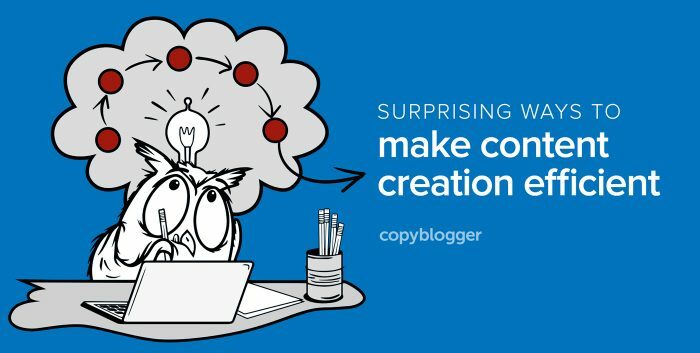 Why does creating content become more fun over time? Content marketing offers those of us who don’t feel as if we’ve been blessed with the mythical writing gene an opportunity to improve our skills one piece of content at a time. Think about it: if you want to learn to cook, you start with the basics. How to boil water. How to make toast. As you master these basic skills, you enjoy the fruits of your labors: you eat the broth you boiled or chew the toast you made. It’s the same thing with content. Even your earliest attempts at published content will work for your business. As long as it’s carefully crafted, search engines will begin to find it and lend authority to your site. It doesn’t have to be a masterpiece to benefit your business. But as you write more, something will occur naturally. Just like practicing cooking over time will allow you to make more complex and delicious dishes you can then eat and enjoy, consistently creating content will help you build your mastery. You’ll find you can go from idea to finished product faster and more smoothly. You’ll know you can count on your content creation skills to create ever more sophisticated content marketing for your business. It may come as no surprise, then, that content creation tends to become more fun over time. That’s the effect mastery has! When you’ve built your skills and they’ve become a resource you can easily draw on, you enjoy the process — you even look forward to it. That’s why I’d like you to look at your content as if it’s a body of work you’re going to create. Don’t think too much. Just write. The best ideas come from a place in your mind that’s not standing in judgment or full of worry. It’s not distracted or stressed. It’s relaxed and looking forward to just doing the work, in happy anticipation of the process more than the final product. When you get yourself to this place — and I promise if you put in a few weeks of consistent practice you’ll get there — you’ll look forward to this creative time. Creating content will be a joyful job you’ll want to do often.